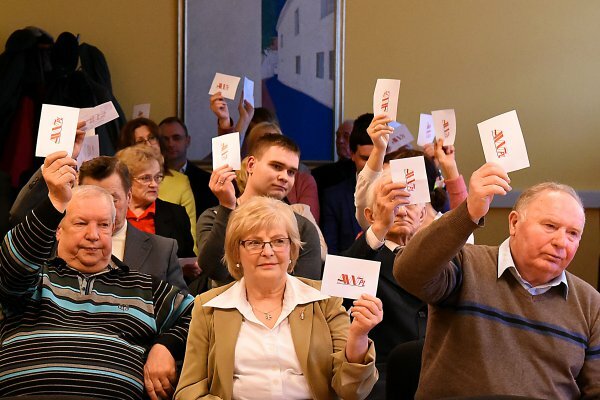 On 1st April in the House of Polish Culture a report-and-election conference held by the Vilnius Division of the Electoral Action of Poles in Lithuania (AWPL) took place. When presenting the Division Presidium report, Wanda Krawczonok, the Chairman of the Division and Deputy Chairman of the AWPL parliamentary group, pointed out that four years ago 36 delegates from 22 Vilnius clubs had come to a similar meeting. “Today 70 delegates from 25 clubs have been designated to attend the conference. During that time new clubs emerged; the Division is extending then and we’re very glad that there are so many people who support our social work,” she said. The party’s Vilnius Division Chairman mentioned a number of reasons that had caused the AWPL to compare favourably with other political groups in the country. “After the AWPL report-and-election convention, pre-election work began – the election to the Lithuanian parliament was before us. The results were momentous. For the first time the AWPL was able to form its group in the Seimas. Today, at the end of the four-year term of office, we can see that the parliamentary group has saved its identity and face, the members haven’t changed, and nobody has sought some better place, which, for us gathered here, is natural. Today, the day before the election, we can see what’s happening in Lithuania’s political arena, how many MPs from various political options are looking for a “better” place, migrating from one party to another. Our MPs are very consistent. This stability, keeping the word of honour, defence of Christian values and ordinary citizens’ issues are, as it turns out, something of a rarity. Maybe that’s why when we left the ruling coalition and our representatives in the committees handed in their resignation, those requests were not considered, and the positions occupied by the Seimas Deputy Chairman or the Deputy Chairman of the National Security and Defence Committee – and of the Human Rights Committee for a long time – were taken over by our representatives who’ve been working there to this day,” W. Krawczonok said. One of the basic tasks and activities of the AWPL parliamentary group in Vilnius, as she said, is cooperation with the communities of schools that apply for accreditation. “The coalition of Liberals and Conservatives follows its cynical plan aimed at destroying the network of Polish schools, as well as Russian ones in Vilnius. The community does not and will not agree with it,” the Chairman declared and presented briefly AWPL representatives’ actions performed in order to save the Polish schools in Vilnius. The MP talked about the successes in elections of various levels achieved by the party in the last four years. “Electoral successes are a collective achievement, but, above all, an achievement credited to good managing, wise decisions, and the strategy of the management in the first place, more precisely – Valdemar Tomaševski’s,” she stressed. When opening the discussion, Edmund Szot from the AWPL club “Markučiai” thanked the Electoral Action councillors for their work and effort, which had resulted in the supply of water and gas to many Vilnian homes in the Markučiai district. Not only could we hear thanks but also requests addressed to the AWPL group in the council of the Vilnius City. The club representatives asked among others for renovation of a street in Užusieniai, improvement of the infrastructure in Grigiškės, as well as help in the Vilnius-region councillors’ efforts to save the Gudeliai village from sinking at the final stage of the bypass construction. Chairman of the Association of Polish Schools Teachers “Macierz Szkolna” in Lithuania and Member of the Lithuanian Parliament Józef Kwiatkowski pointed out that the work of the AWPL group was visible, needed, and important, on behalf of Polish teachers thanked the grouping’s management and the party councillors in Vilnius for their work in aid of preserving the holdings of the Polish education there. “In the last four years the Polish education became a very popular and controversial topic, although it wasn’t a rare one for the last 25 years either. Every year the Polish education has become more and more threatened,” he said, and added that thanks to active proceedings of the AWPL, Poles, and parents it was possible to prevent the authorities’ ignoble plans of depleting the holdings of the Polish minority in the education field. The parliamentarian stated that the information on Polish schools that had been distributed in the public space had been false and defamatory. “The truth is that for many years the number of Polish children in Polish schools has remained on the same level,” he said, and expressed his hope that the Polish community would not let its schools be buried. “The plans of winding down the Polish education have a long-standing tradition. After all, we’ve managed to save it, and so we’ll manage to save other threatened schools for sure, but we must put a lot of effort into this faith,” the MP appealed to people that only a school bringing up in the native language was the best for Polish children. Valdemar Tomaševski, the AWPL Chairman and a Member of the European Parliament, gave his congratulations to the Division on another stage of work, thanked the management and all the members for their work, often performed sparing no effort and health. He expressed his contentment with the increasing dynamics of electors’ support from 20,000 votes in 2007 to 45,000 in 2014. “In Vilnius we have already a whole army of voters, and each vote is like a cartridge in the rifle,” said the Chairman, adding that the votes are just a means for getting the opportunity to solve the problems of residents. “It is necessary to do everything to improve the residents’ standard of living according to their needs, after all justifiable ones. It is necessary to keep up with the residents’ problems and resolve them,” thus V. Tomaševski specified the directions of the performed and future work, enumerating among others AWPL councillors’ attempts to invest not only in the central part of the capital city, but also in the districts that are more distant. As one of the priorities of AWPL representatives’ work the Electoral Action Chairman mentioned the education. “We’ve managed to do a lot in this field. Our opponents’ plan assumes winding down of the Polish schools, but we’ve succeeded in maintaining the ratio of the Polish children attending Polish schools at the level of 3.5% in the scale of the country. This ratio is almost double the one in 1988,” the Chairman of the grouping mentioned the successes of Polish determination. He claimed that as early as in 2000 and 2005 the Vilnius City Council had tried to lead the Joachim Lelewel Secondary School to a close-down. “We’ve preserved it. It was worth to strive and work to reach this aim. It’s similar to rowing upstream, but we row hard and it’s not a Sisyphean labour, but a much-needed one. It won’t be easy, but there’s a huge chance that we’ll save our schools,” he emphasised, and added that a good example of effectiveness when fighting believing in the victory was the Września children strike in the years 1901-1902. “As the hosts of this land, as the native population, we have greater ambitions than just resisting the attempts to harm our community. Our aim is to unite not only the Polish minority or national minorities, but also Lithuanians. We have a lot to offer: Christian values, exemplars of power exercising, keeping one’s word, and honest work for the good of every voter,” V. Tomaševski highlighted. The Electoral Action leader emphasised that nowadays the world of politics lacked honesty and values a lot, whereas the AWPL from the beginning had prioritised needs and interests of the residents, exercising power and taking actions based on Christian values honestly and solidly. He mentioned that in their daily work party’s representatives were guided by teachings of John Paul II. The Polish Pope appealed to social and political activists for the respect for voters’ rights, respect for political opponents’ rights, honesty in contact between the ruling and the ruled, as well as rejection of vile methods of gaining, maintaining, and extending the power at all costs. “These rules are our permanent guidelines in the daily work. We don’t strive to maintain the power at all costs, a good proof of which is leaving the ruling coalition when our partners did not execute the coalition contract. The residents judged that move rightly, as we obtained a larger number of votes in the election. We focus on fundamentalness and do not traduce our opponents,” V. Tomaševski pointed out. The Electoral Action leader specified two basic priorities of the election platform: Christian values and honest work, as well as a package of prosocial acts increasing the residents’ income. The grouping proposes making the basic pension conditional on the average remuneration for work, which will make it possible to raise seniors’ benefits by 15%; introduction of the Large Family Card entitling the numerous families to discounts and other reliefs; and paying €120 once a month for every offspring born as the second or subsequent. The Chairman mentioned that in the last years, thanks to the AWPL initiative, VAT for the tourism sector had been lowered from 21% to 9%, and the financing of local roads had been increased from 20% to 30%. V. Tomaševski ensured that the AWPL Members of Parliament would put forward a proposition of raising the pool to 40%. After the party leader’s speech, an election of the chairman of the Vilnius City AWPL Division was ordered, and it was Wanda Krawczonok who was chosen unanimously for the next term of office. The Chairman didn’t hide that she felt really moved by the reelection, and thanked her associates for the trust they had had in her and the whole team for the joint work. Simultaneously, Deputy Chairman of the party’s Vilnius Division Tadeusz Ławrynowicz and the secretary Renata Sobieska-Monkiewicz enjoyed their reelection, with Edyta Szyszko being chosen as the Division’s treasurer. Flowers and thanks for the performed work were given to the chairmen stepping down after being in charge of specific AWPL clubs in the Vilnius City: Nela Mongin, Teresa Zacharewicz, Wojciech Aszkiełowicz. Some of them have brought up their proper replacements, some joined the AWPL members of the Vilnius region. On the initiative of Valdemar Tomaševski, at the end of the conference, the members of the assembly commemorated Artur Górski, the Faithful Friend of the Vilnius Region, who had passed away on 1st April. Tomaševski Resigning from Running for the Parliament?